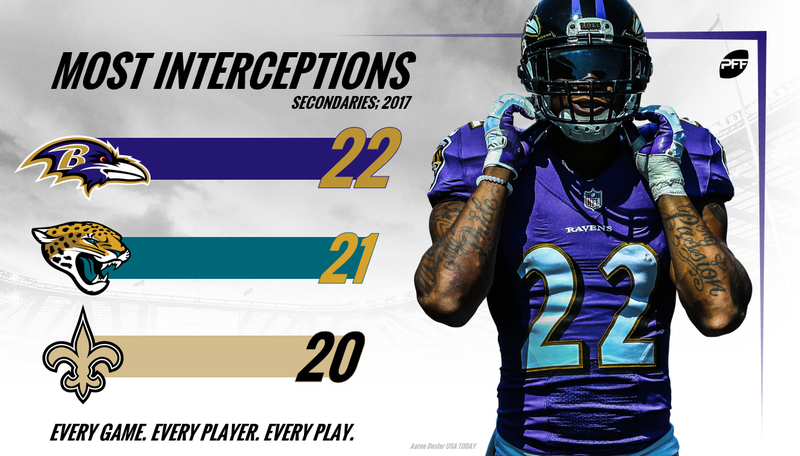 We’ve been going through the top units across the NFL over the past few weeks, including our oft-talked about offensive line rankings, our defensive unit rankings on pass-rush and run-defense, but now we turn our attention to the secondaries. This is the one area of the football field that you can’t fake. If you don’t have the talent on the back end, your defense is in for a long season. Whereas the teams at the top of these rankings only need a competent offense to write their ticket to the playoffs. While they’ve taken a little hit with the loss of Aaron Colvin, they still own the league’s best cornerback tandem. Targeting Bouye and Ramsey last season netted opposing quarterbacks a cool 36.8 passer rating. They’re no slouch at safety either where Gipson (81.4 overall grade in 2017) and Church (83.2) are both quality starters. The Chargers might not have the best cornerback duo in the game, they go deeper at the position than any team in the NFL currently. Casey Hayward (96.7 overall grade, and our top cornerback for this season), Desmond King (86.5), Trevor Williams (88.5) and Jason Verrett could all make a starting three rotation anywhere else in the NFL. One will have to be relegated to dime packages though come Week 1. Now they’ve added PFF’s top draftable safety and top five player on our board in James. Good luck to the rest of the AFC West. The Rams were already one of the best pass defenses in the league in 2017 and no one arguably upgraded their secondary more this offseason. They subbed in Talib (86.2) and Peters (85.7) for Kayvon Webster (71.1) and Trumaine Johnson (74.2) at corner. Those two now team up with one of the league’s top slot corners in Robey-Coleman (84.9) to form a secondary that legitimately has no weak link. Another secondary bereft of holes. The return of Young only makes this a more formidable unit. The third-year corner had a 79.9 overall grade as a rookie before tearing his ACL last year. Brandon Carr‘s veteran presence also holds weight but the real key for this unit though will be the recovery of number one corner Smith. He only allowed a passer rating of 49.2 last year when targeted before tearing his Achilles. 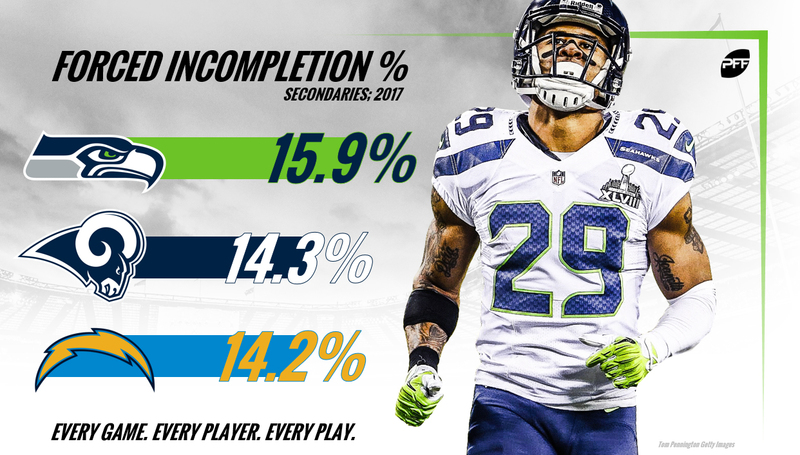 Atlanta’s secondary was already among the deepest in the NFL before they added Isaiah Oliver in the second round this past April. He could be relegated to the Falcons dime packages this fall with both Alford and Trufant earning grades above 80.0 a season ago. Their weakest link comes in the slot where Poole has just barely cracked 70.0 each of his two seasons in the NFL. This unit is led by Smith, the highest-graded safety in the NFL a season ago (97.0). He makes his presence felt in both coverage and against the run as one of the most versatile safeties in the league. They would rank higher if not for the question marks that exist across from Rhodes. Terence Newman had been the incumbent there, but his play noticeably slipped last season at 39 years old and was past up on the depth chart. Former first-rounder Waynes started last season, but was inconsistent throughout the year and most notably gave up 116 yards in the Vikings championship game loss. The wildcard here is rookie first-round pick Mike Hughes out of UCF who was one of PFF’s favorite corners in the draft. The Bills quietly assembled one of the league’s best safety tandems through shrewd free agent deals last offseason. 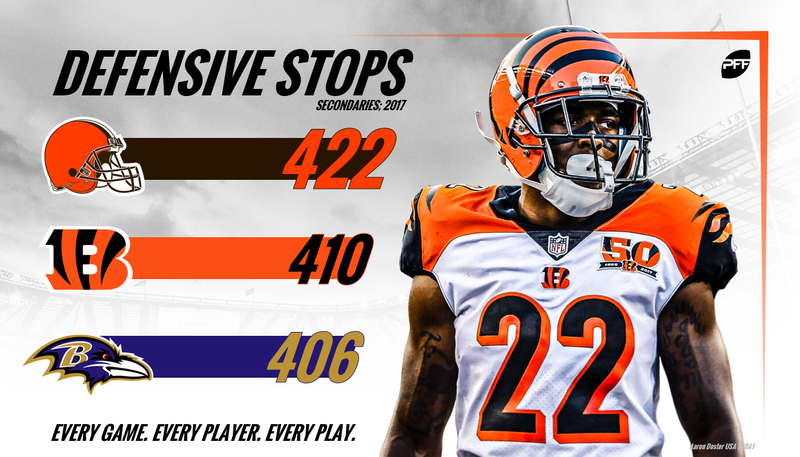 They doled out less than $10 million per year combined on Poyer (87.6) and Hyde (87.2) before the duo combined for more pass deflection and interceptions than any other safety tandem (21). Combine them with 2017 PFF Defensive Rookie of the Year in White, and you have a formidable unit. It’s amazing to see how far the Saints have come in the course of one year. That’s what drafting a Pro Bowl caliber corner and safety in back-to-back rounds will do for you. Lattimore was a revelation for the Saints in Year 1, allowing a passer rating of 45.3 when targeted. While most will remember Williams for whiffing on Stefon Diggs in the playoffs, his previous 1,102 snaps were a far cry quality-wise from his last one. He earned himself an 86.8 overall grade and only missed five tackles all year. Yet another team who has improved by leaps in bounds in the course of a year. 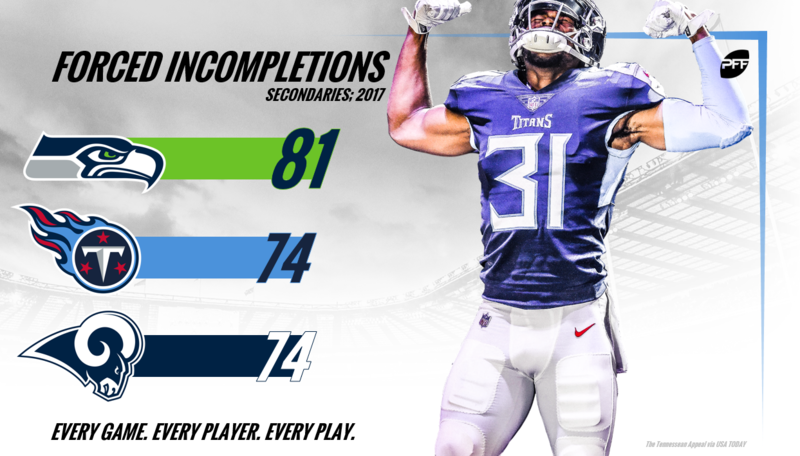 The Titans had arguably one of the worst secondaries in the NFL back in 2016, but now feature as one of the best. The addition of Butler next to Jackson and Ryan along with the improvement from Byard make this a complete unit. 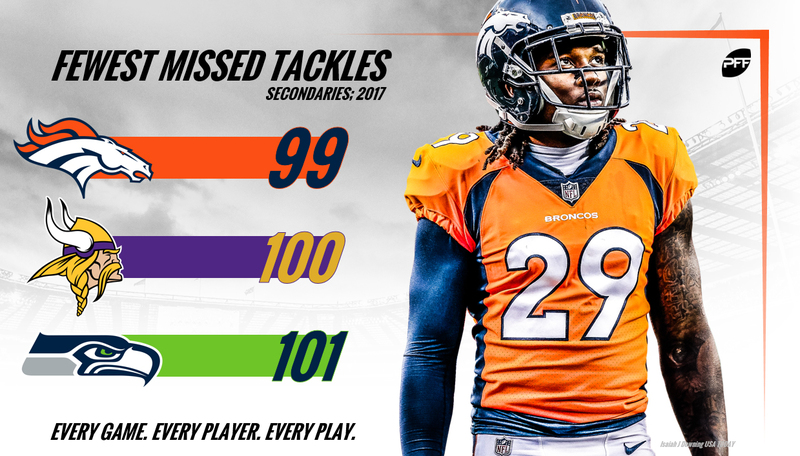 It’s tough to lose a top 15 corner like Aqib Talib and still have one of the best secondaries in the NFL, but that’s how good Denver has been the past few years. With Sherman in the fold, it’s the 49ers who now have their own makings of the original Legion of Boom. You’d be hard pressed to find a longer starting cornerback duo than Sherman and the 6-foot-3 Witherspoon. The latter was one of the most impressive rookies in the NFL a season ago, allowing only 59.6 percent of his targets to be completed. Sherman on the other hand has allowed a catch rate of only 47.7 percent for his entire career. There’s some projection with Sherman coming off an Achilles injury, but if he’s anywhere close to healthy they should be scary. The Lions book their 12 spot via two of the most underrated players at their respective positions in the NFL. Slay has broken up 40 passes over the past four seasons and only allowed a passer rating against of 55.6 in 2017. Quin on the other hand has graded out above 80.0 for five of the last six years. One need look no further than the Super Bowl to see what the loss of Malcolm Butler might do to this defense. Even during the worst season of his career, Butler was still a key cog on the back end in New England. Signing (Jason) McCourty could help mitigate the loss some, but he put up the bulk of his 83.9 overall grade last year playing zone coverage whereas the Patriots have been traditionally man heavy. McCourty was cut in Tennessee after three straight seasons struggling in man-heavy schemes. The Bengals earn this high ranking almost solely on the backs of Jackson III. After missing all of his rookie season, Jackson was a revelation in Year 2. Most notable were Jackson’s performances while covering Antonio Brown. In the two games against the Steelers last season, he was targeted seven times while guarding Brown and allowed zero catches with four pass breakups. It’s exciting to see what he’ll do starting full-time this fall. The once-dominant Giants pass defense that had more interceptions than touchdowns allowed in 2016 has lost some of its luster. Gone is Dominique Rodgers-Cromartie while Jenkins’ play came crashing back down to earth after his career year. The key for them will be the development of former top 10 pick in Apple, who is now thrust into a starting role. He’s flashed that first-round talent at times, but has been mired by inconsistency. For his career, he’s allowed a passer rating against of 108.4. The Bears have a very solid, if unspectacular starting four on the backend. Amukamara has quietly not had a single season graded below 75.0 since his rookie year in 2011 while Fuller finally lived up to his first-round hype with an 84.3 overall grade last season. The budding star of the unit though is Amos who earned the second-highest grade of safeties in the NFL last season (92.0). 2017 was always going to have some growing pains with as many youngsters as the Cowboys had in their secondary, while 2018 though offers much more promise. Rookies Woods (78.8), Awuzie (81.7) and Lewis (79.6) all impressed when given a shot. If any or all improve on their rookie-season form, Dallas’ secondary could end up ranked much higher than 17th by the end of the season. The loss of slot cornerback Patrick Robinson and the question marks his absence leaves cannot be understated. 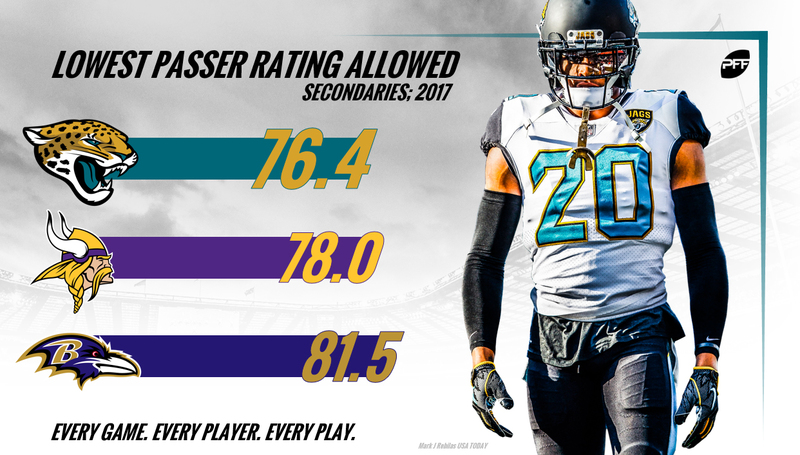 With all the draft picks in recent years at the corner position, no one besides Darby should be safe in their starting spot. The good news is that their is so much competition, the bad news is that none graded higher than Mills’ 77.1 overall grade a season ago. Luckily for the Cardinals, the starting spot across from Peterson is one of the easiest jobs in the NFL. Unluckily for them, they lost Tramon Wililams this offseason and have little hope of replacing his production from a season ago. They traded for Taylor this offseason from Cleveland, but there was a reason why the talent-needy Browns were willing to part ways with the former second-round pick. Taylor allowed 69.3 percent of his targets to be completed a season ago and has allowed a passer rating of 111.4 in his coverage for his career. The Redskins have talent here, but a lot will depend on two veterans returning to form. Scandrick, their 31-year-old free agent signing, had two of his last three seasons graded at 84.0 or higher before disappointing with a 41.5 overall grade last year. Norman has not quite lived up to his lofty contract in Washington and had his lowest graded seasons since 2013 last year (79.1). They still have Thomas, but you’ll have to squint fairly hard to make the rest of Seattle’s secondary look anything like the Legion of Boom. The most encouraging thing you can say about them is that last year’s third-round pick in (Shaquill) Griffin held up admirably across from Richard Sherman for much of the year. He allowed only 52.9 percent of his targets to be completed and a passer rating of 75.2. It’s rare to see a safety come into the league and be able to execute a number of different roles early in his career, but that’s what made Adams a top 10 pick a season ago. Adams lined up all over the formation with over 100 snaps as deep safety, box safety, linebacker and even slot corner a season ago. His 81.2 overall grade on those snaps means he can more than hold his own wherever he lines up. The Steelers have thrown a lot of resources at their secondary in recent years, but not much has stuck. We’ll see if that changes with the additions of Burnett and Edmunds this offseason. Arguably the most productive player in their back end at the moment was the one that took the least resources to get. Hilton, the former undrafted free agent, was exceptional last season manning the slot for the Steelers. He only allowed 8.8 yards per catch in his coverage and a 74.6 passer rating. The budget signing of Melvin could pay off big dividends after his career year a season ago (85.7). They’ll need last year’s first-round pick – Conley – to get back healthy after playing only 92 snaps a season ago. Conley allowed only 14 catches on 42 targets his last season at Ohio State for a passer rating of 14.0. The Texans had arguably the worst secondary in the NFL by the end of last season and their moves this offseason recognized that. They signed safety Mathieu (77.6) after he was cut by Arizona and also added a slot corner in Colvin (80.0) from Jacksonville. They could still be in trouble if their former first-round pick in Johnson plays like he did a season ago. Johnson was the lowest-graded corner in the NFL and allowed a passer rating of 137.3. While Fitzpatrick was a PFF favorite coming out of the 2018 NFL Draft and should excel in the slot, it remains to be seen how Howard and Tankersley will hold up on the outside. The young corners took their lumps a season ago with Howard earning a 56.0 overall grade and Tankersley a 53.6, but both flashed late in the season. Howard had a dominant two-pick performance against the Patriots while Tankersley didn’t allow a single catch in Week 17 against Buffalo. Ranking the Packers secondary is somewhat futile at this point in time. It’s feasible that two of their starting three corners could be rookies and complete unknowns for evaluation purposes. Even their second-year corner in King is a difficult projection as he earned much of his 41.0 overall grade a season ago while playing with a bum shoulder. Of all the teams down towards the bottom of these rankings, the Packers have the most reason for hope. The loss of Marcus Peters is obviously a huge blow to this defense, but the trade for Kendall Fuller was a shrewd move to replace the former first-round pick. Fuller earned a 90.0 overall grade, but up to this point in his career has primarily manned the slot. It will be interesting to see if he moves to a full-time role in Kansas City and starts playing on the outside where he’s only seen 88 snaps so far in his career. There’s some reason for hope in Carolina with rookies Jackson and Rashaan Gaulden in the fold along side free-agent signing Ross Cockrell, but it’s going to come down to the play of former second-round pick Bradberry. In his second season, he earned just a 42.4 overall grade and allowed 795 yards in his coverage. Talent-wise, the Browns are night and day from where they were at this point a season ago. They brought a couple of free agents coming off career years in Gaines (86.1) and Carrie (84.3). Cleveland also traded for Randall (70.9) and then drafted Ohio State’s Ward with the fourth overall pick. That’s a good start for a team that was almost completely bereft of talent heading into the offseason, but it remains to be seen how the pieces will mesh in Greg Williams’ defense. This ranking reflects not only the uncertainty at corner in Tampa Bay, but also the ineptitude at safety. Conte will once again be starting despite never having earned a grade of 75.0 or higher for his entire career. Last year’s second-round pick Evans will likely start as well, but his missed-tackle problem from college carried over to the pros where he was 61st out of 72 starting safeties last year in tackling efficiency. If you’re not a Colts fan, you may not even recognize some of the names that will be getting playing time at corner in Indy this season. Outside of last year’s second-round pick – Wilson – who had a 78.6 overall grade in 402 snaps, the Colts will be throwing out the likes of Desir, Hairston, Kenny Moore and D.J. White. Even though none of them are rookies, the five have played only a combined 2,430 snaps in their careers.